Have you ever lost your keys, left them in your car, or had them stolen, and arrived home completely locked out? It’s an awful situation. At A-Access Lock & Key, we believe the only thing worse than being in an emergency lockout is not knowing what to do. That’s when this post of guidance from our Licensed Locksmith in Charlotte NC can help. In this ‘Locksmith How-To’ blog post, we’ll be talking about how to deal with an emergency lockout. Being locked out is no fun, so it should be treated as an emergency by a highly qualified lockout expert. If you find yourself is this rather unpleasant and unattractive scenario, there are a few things you can do. If you are forced into a lockout scenario, the first step is to remain calm. Take a deep breath and count to ten before jumping to conclusions or rushing to actions. This instance could happen (and has happened) to many people before you, so remind yourself that you’re not alone. This applies regardless of whether you are locked out of your car, home, or corporate office. You need to keep a cool head in an emergency situation. This eliminates confusion and enables you to think clearly. The people with the calmest heads are the ones who come out on top. Don’t panic or fidget. Tell yourself that you’re going to get out of the situation just fine, because you are. Now, you need to look around for any signs of immediate danger. Protecting yourself is key. Your house might have been burgled and a criminal could be inside right now. Signs of a break-in include a broken lock or broken windows. If this is the case or anything seems out of the ordinary, dial 911 as soon as possible. Look at the situation as a whole and analyze why this happened. Lockouts may happen because you left your keys at home, accidentally misplaced them, or grabbed the wrong set of keys instead. You may also have the correct keys but they are broken, damaged, or just not working for some reason. If this is the case, don’t continue to try forcing the door open. You will only make the problem worse. Forcing the issue might end up breaking the key or the lock even more. Your key might also end up stuck in the lock. This is even more of a nightmare to deal with. Perform a complete and thorough analysis. The more you know, the better. Now that you have all the information, it’s time to get help. A-Access Lock & Key to the rescue! If you live in Charlotte, Matthews, Indian Trail, Fort Mill, or anywhere in between, call us at 704-545-5410. We are the top Emergency Lockout Charlotte Specialist. There is no other Locksmith in the city more experienced with emergency lockouts than us. If you are locked out of your business, home, or automobile, we can get you in. Our team comes to you. We are experts in gaining non-destructive entry to your car, office, home, or apartment if and when you find yourself locked out. Emerge from the emergency lockout unscathed. We also help you take the necessary precautions to minimize the risk of another lockout occurring in the future. If you ever encounter these problems in your day to day life, feel free to get in touch with our Expert Locksmith. If you’re dealing with a lockout, we can help you gain entry. We provide fast and damage-free emergency Locksmith services. A-Access Lock & Key uses highly specialized methods such as bumping and picking to ensure that your property will be undamaged and your lock and door will still be fully functioning and intact after we get the job done. We have encountered hundreds of emergency lockout situations, each with a different scenario, and we have seen many people locked out in different ways. We at A-Access Lock & Key are committed to providing non-invasive, private, and hassle-free lockout solutions to our Locksmith clients in Charlotte. You never know when you will come across these issues, and it can happen to anyone. This is precisely why you should have constant access to a professional and trustworthy Charlotte Locksmith like A-Access Lock & Key. The best solution is just a phone call away at 704-545-5410. What Can You Expect From Our Charlotte Locksmith? With more than 20 years of service in the industry, A-Access Lock & Key has made hundreds of customers happy. We are ALOA Certified and BBB accredited, plus, we received the 2013 Angie’s List Super Service Award for Locksmiths. An honest and fair estimate over the phone— Our over the phone quotes are mostly similar to the final price, mainly because we know the ins and outs of the locks and keys industry. We have no part in the bad history of Charlotte Locksmiths overcharging clients in emergency situations. Locksmiths showing up on time and well prepared— Being fully trained and highly skilled, our technician(s) will come to you fully equipped and prepared to handle any kind of emergency lockout situation. Private, courteous and professional service—we believe in developing a high level of trust with our clients, which is why our customers have been trusting us with their homes, offices, and properties for more than 20 years. That, and so much more, are what you will be getting from A-Access Lock & Key, the Charlotte Locksmith you can trust. If you want to break out of lockouts, then we are the Emergency Locksmith in Charlotte, North Carolina that you’re looking for. We treat the situation as exactly what it is: an emergency. As Charlotte’s #1 Expert Locksmith, our trusty Locksmith Van can reach you in a matter of minutes. Don’t fret one bit. Choose A-Access Lock & Key. We are the key to your security! Call us at 704-545-5410 whenever you’re in need. 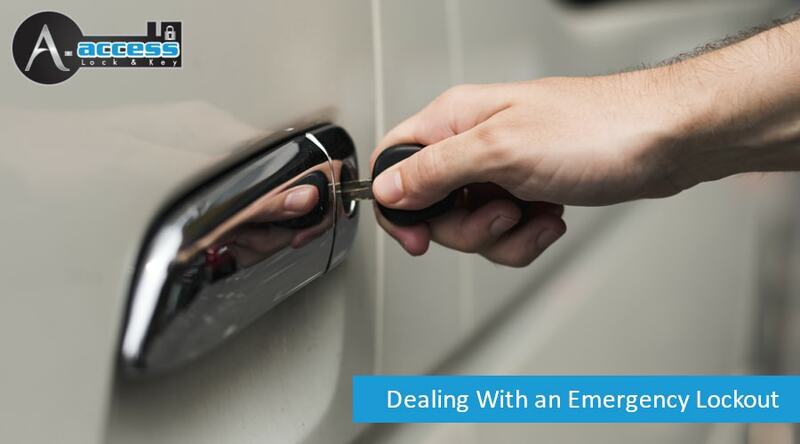 Get out of an Emergency Lockout with our Expert Locksmith’s assistance!